Waypoint Health Innovations is determined to make behavioral health care more accessible, measurable, and cost-efficient. We combine lessons from proven traditional care with the reach, convenience, and consistency of digital programs. Our development process starts by identifying specific techniques from clinician-led cognitive behavior therapy (CBT) that have been validated in peer-reviewed studies. We distill them in to fully digital interventions that combine sophisticated algorithms, rich content, and interactive elements to create structured, personalized programs. Individuals using our programs experience strong symptom improvement without ongoing support from clinicians, results unmatched by other programs. The prevalence of behavioral disorders and and barriers to their treatment drive enormous cost for payers, employers, and the people suffering from them. We work with value-oriented providers, health plans, employers, and other organizations that have a stake in improving access to evidence-based behavioral health care. Our programs help them close the gap by removing barriers to care in a measurable, cost-efficient way. Introducing Thrive, personalized digital care for depression. 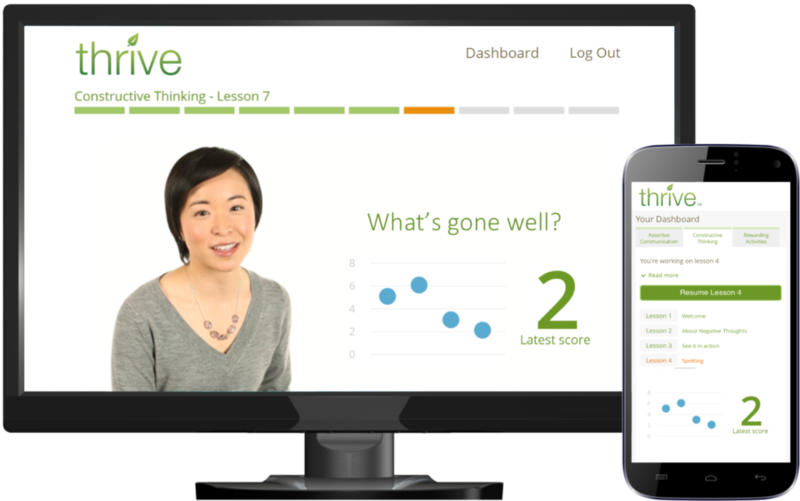 Above: Thrive, our program for depression, available via the web or our mobile app. Online CBT for depression and anxiety. a very difficult time in this senior's life." recommended seem doable and straightforward. We’re committed to performing rigorous evaluation of our programs. Currently, three clinical trials are underway to study Thrive, our program for depression. If your organization wants to deliver scalable, measurable evidence-based behavioral health care, get in touch with us to ask how we can help.